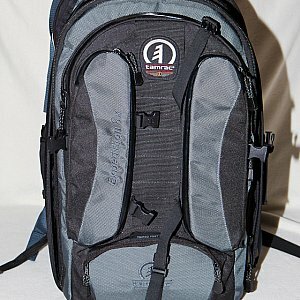 In the past I owned a lot of camera backpacks. 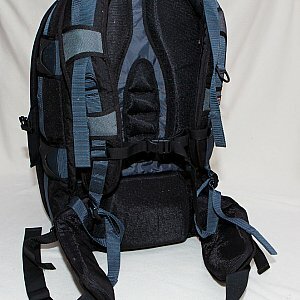 I stared with simple shoulder bags and while the gear collection grew the bags had to grew too. 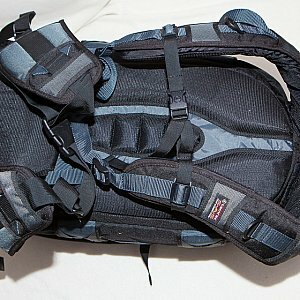 I moved from the Crumpler Brian's Hot Tub to the Tamrac Expedition 8 in 2009. At this time I was able to fit almost the complete gear and a notebook in it. 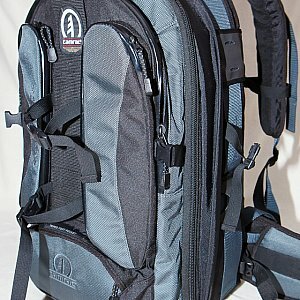 Compared to any other camera backpack the Tamrac Expedition 8 is huge. It is well padded and comfortable. The Expedition 8 is very well build. 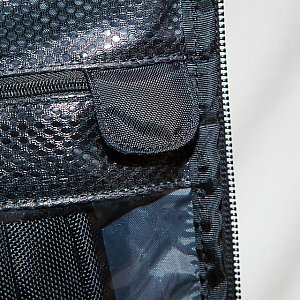 The three outer pockets (two wing pockets and the computer pocket) have water-resistant zippers. 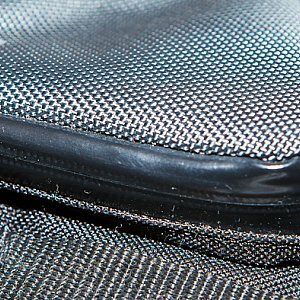 The zip of the main compartment is protected by a lockable rain flap. The computer compartment and the main compartment is well padded. I didn't take this giant out too many times but I think it'll be hard to harm it. 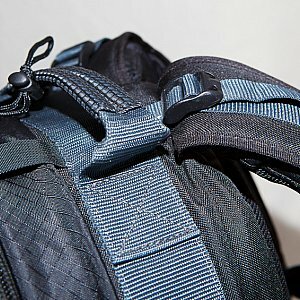 There are a lot ways to even add more space to this backpack. You can add a tripod to the front. 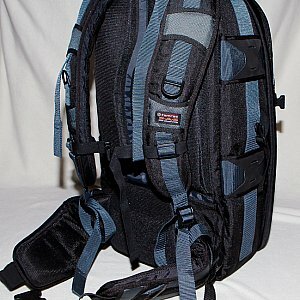 You can mount your camera to the shoulder strap D-rings. 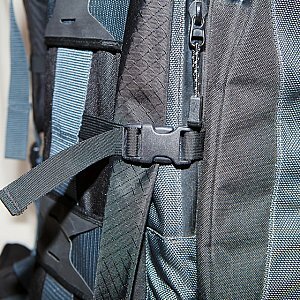 You can mount additional modules by mounting them to the attachment slots on both sides of the backpack. 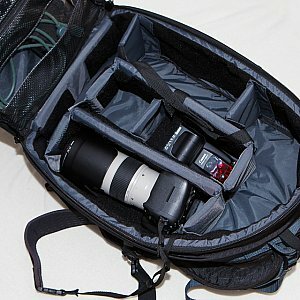 I was able to mount two Think Tank Photo Lightning Fast bags for carrying additional speedlites. 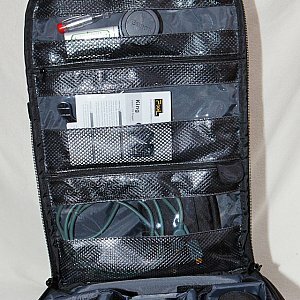 Tamrac offers there own modules called "Modular Accessory System" products. The wing pockets at the front store a lot of small items like batteries, memory cards, cables and chargers. The pocket at the bottom of the front is for the foot of a mounted tripod. But you can use it for other things too if you don't mount a tripod. The computer pocket is also part of the front flap and takes up to 17" notebooks. 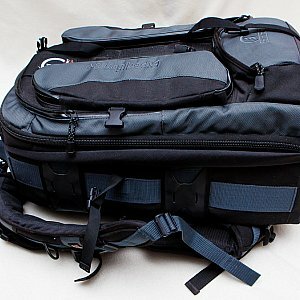 The main compartment has three window pockets in the front flap where you can store things like filters, mini light stands, radio triggers, cables and other stuff like this. Shipped with a lot of Velcro dividers you can configure the camera compartment as you like. It takes a camera body with attached 70-200 lens with ease. Adding a second camera with attached lens is just as little an issue as adding more lenses, speedlites, extenders and stuff is. I just can repeat myself: this backpack is huge. I wanted to have a huge backpack and I got one. It is very well build, comfortable and offers a lot of space. But you have to pay a price for all this comfort. 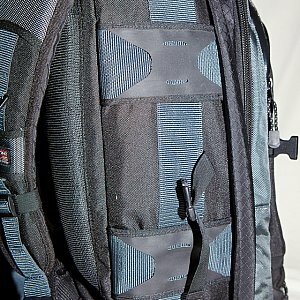 The padding makes this backpack even huger. So the main advantage is the main drawback at the same time. Anyway: I can highly recommend this backpack. If you want a monster you'll get a very good one!